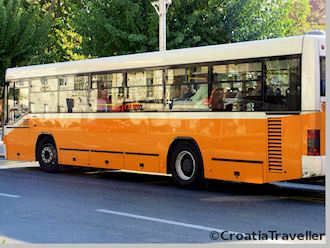 Getting around Dubrovnik by bus is a breeze and is in fact the best way to experience the town. Traffic around the Old Town can be a nightmare while parking is expensive and difficult. All the neighborhoods are linked by buses that run anywhere from every 10 minutes to every half hour. (See a map of Dubrovnik's bus network). They begin running at about 5am and pick up their last passengers around midnight. The fare is 15Kn if you buy from the driver (exact change only) but only 12Kn if you buy from a kiosk (tisak). A "day card" with unlimited rides is 30Kn. Tickets are also available from the reception desks of most hotels, at travel agencies, at the bus station and at the stall at Pile Gate. When you board the bus, make sure you validate the ticket by inserting it into a validating machine or you'll be liable for a fine. For more detailed information about timetables see, the website of Libertas Dubrovnik, the local company that manages the routes.